In this article, we are providing you the details regarding the Death Certificate Online Registration Procedure. The death certificate is the legal document issued by the government of India to certify the deceased state of an individual. As per the Indian law, it is mandatory to register each and every death within 21 days of its happening. Now the question occurs that Who Can Register Death? The death can be registered by family member/nearest relatives of the deceased, local police in-charge, authorized hospitals etc, it may also vary from situations. In order to register the death of deceased, the proper documentation is required and the proof, date and time of the death are also required. Here on this page, we are describing the Death Certificate Online Registration Procedure for the state Uttar Pradesh. If you are the resident of Uttar Pradesh then you can register death either by online mode or by offline mode. If you want to get death certificate via online mode then you can get it by visiting the official portal of UP Mrityu Praman Patra. Both online and offline procedure to obtain Death Certificate has been well stated below. 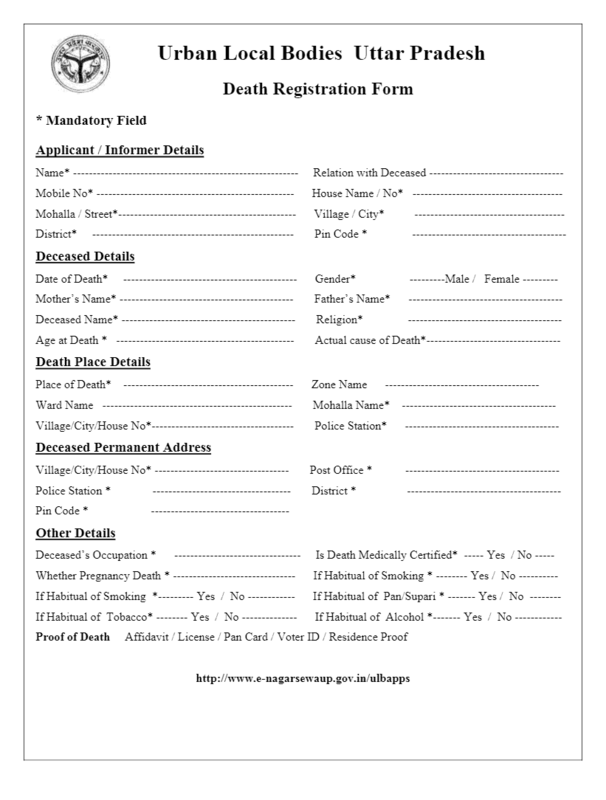 One can easily obtain the death certificate of deceased by following below provided steps. If Death Happens In House- If the death of the individuals occurs in the house then the head of the family or other family member are eligible to register death. If Death Happens In the Hospital- If any of the person dies in the hospital or clinic then such institute or clinic is responsible for register death of that person. If Person Dies in Jail- Jail In-Charge is responsible to register the details of the person dies in the jail. If Individual Dies in a public place- Any person near the person local police in-charge or the head of the /society village can register death. If the death of the individuals registered for one year then Affidavit is required. First of all visit to the nearest office of the Common service centers (CSC) center. Thereafter you have to get the death certificate application form from there. Now fill the application form by providing the complete details and must ensure that the details should be filled as per the guidelines. Thereafter you have to submit the filled application form at CSC operator. Once you submit the form you will get the confirmation SMS at your registered mobile number. Finally, you can collect the death certificate at the scheduled date. Thereafter you are required to hit on “Citizen’s Login” link available at the top menu bar of the home page. Now register yourself by proving the registration details and already register candidates can log in by entering login details. Thereafter you are required to hit on the appropriate link for a death certificate. Now you have to upload the scanned passport size photograph of a deceased person. Submit the form and finally print the death certificate by giving print command. From the home page, you have to hit on “Death Certificate” link visible under the services for the citizen. Thereafter press “Check Status” link provided. Finally hit on submit button your status will appear at your screen.